That's my Baby German Shepherd!!!! I lost a GSD eight years ago, to a neighbor giving him poison and I have been praying for another GSD, preferably long coated. She came from a home that had (19) GSD's in a mobile home, and she (Baby) was more than likely low on the totem pole, of pack order. These people were feeding (19) GSD’s one 20lb. bag of dog food, a week. They gave Baby to some other people “free”, to their best friend. The people that were given Baby also had a Pitt, enough said, as my mind was really doing a number, on me, and they wanted $150.00 for Baby! I did not know what to expect, basically a total disaster, when Baby got to me. I was excited with anticipation, at 6AM, and as I opened the door, I saw a beautiful long coated GSD, deep red coat, lighter face with innocence expression, with a black saddle, very nervous, and intimidated, to the max. I choked up, and knew when I saw her eyes that she was my “Diamond in the Ruff”, at the present. She was looking at me, as to say: “Get me out of here, and away from these people.” I really need to be taken care of, and most of all loved! I guided Baby to her crate, expressed my gratitude to the people, and excused them from my home, quickly. I then sat beside Baby crying and letting her smell my scent, as I stated that she would have a forever home, and that she was now safe, warm, secure. With time, I have been able to get her trust, groom her gradually with loving care. It’s just great to see her become herself with re-established confidence, and when it’s time to work or protect, my best friend is there, and she really is my prayer answered….My Diamond Baby!! Comments for That's my Baby German Shepherd!!!! Ah, God will have a place for you dear. Your a true loving person. 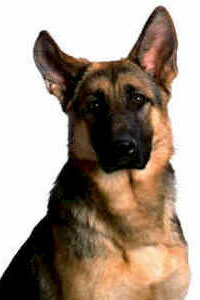 I have a GSD, Zeus whom I love dearly. I have had shepherds for years, and as far as I am concerned theyre 100% better than people. I had a terrible start to 2007. My Beloved Banshee was 13 and was given peace in JAn. 5 weeks later I was devestated to go through the same trauma by having to let Benny go. My Black long hair. He was 7 and had cancer. Benny passed on in MArch. You will understand what I mean. I got Zeus 3 days after loosing Benny. NO. NO. NO. Its not a case of Heard Heartedness, Disloyalty or anything else. Its a simple case of I CAN NOT LIVE WITHOUT A SHEPHERD BY MY SIDE. You are the Diamond. Congratulations to both of you.